Among these 14 community banks, seven are in correction territory and six are in bear market territory -- not a positive backdrop as these banks report earnings. The 14 community banks I'm profiling today were Wall Street favorites in 2015, when they sported positive analyst outlooks. These banks did not meet those expectations, as they increased real estate lending while still saddled by legacy loan exposures in commercial real estate loans, including construction and development loans. On Nov. 12, I explained how to trade community banks as they were reaching risky levels. These institutions were overexposed to real estate loans then, and they still are today. 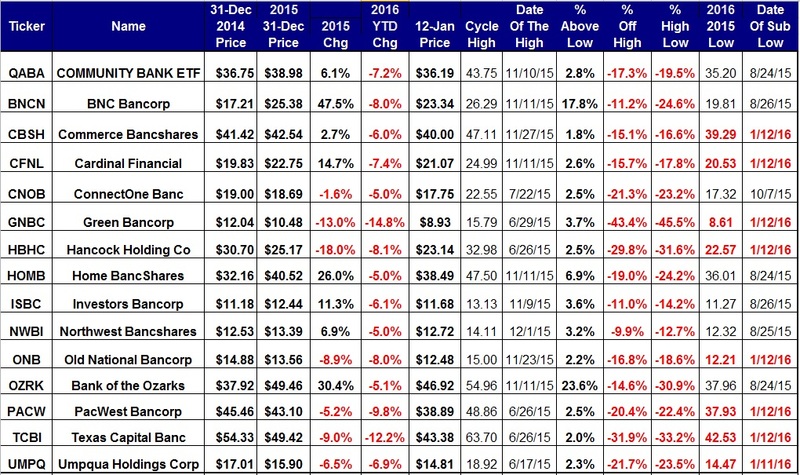 On Dec. 2, I suggested that investors stay away from community and regional bank stocks. This asset-allocation suggestion was based upon data from the FDIC Quarterly Banking Profile for the third quarter of 2015. On Dec. 3, I dug deeper into these concerns, exploring what investors need to know about community banks that are loaded with commercial real estate loans. In short, there were many warnings. Here's the scorecard. Today's focus is on the daily charts as these stocks cascade below their Fibonacci retracements from their all-time or multiyear highs, set between June 17 and Dec. 1, to lows set before the end of 2015. Note that these stocks have been so weak recently that eight set new lows this week. Here are the key levels on technical charts at which it would be advisable to enter good-till-canceled limit orders to buy on weakness or to sell on strength. BNC Bancorp (BNCN -- Key levels are $22.35 until the end of March and $25.82 until the end of June, versus Tuesday's close of $23.34. Beware that this bank remains overexposed to CRE loans. Commerce Bancshares (CBSH - Get Report) -- Key levels are $37.23 for all of 2016 and $43.60 until the end of March, versus Tuesday's close of $40.00. It has no real estate overexposure, but the stock set a new low this week. Cardinal Financial Corp (CFNL -- Key levels for all of 2016 are $17.08 and $21.00, and $23.45 and $26.32 through June, versus Tuesday's close of $21.07. This bank is overexposed to both C&D and CRE loans, and set a new low of 20.54 on Tuesday. ConnectOne Bancorp (CNOB - Get Report) -- A key level for all of 2016 is $15.99, while a key level until the end of March is $19.90, versus Tuesday's close of $17.75. This bank is overexposed to both C&D and CRE loans. Green Bancorp (GNBC -- A key level for all of 2016 is $7.33 with a key level of $10.75 until the end of June, versus Tuesday's close of $8.93. This bank is slightly overexposed to CRE loans and set a new low of $8.61 on Tuesday. Hancock Holding (HBHC -- A key level for all of 2016 is $17.96 with a key level of $24.18 until the end of June, versus Tuesday's close of $23.14. This bank is not overexposed to C&D or CRE loans, but set a new low of $22.57 on Tuesday. Home BancShares (HOMB - Get Report) -- A key level until the end of March is $33.94 with a key level of $43.77 until the end of June, versus Tuesday's close of $38.49. This bank is still overexposed to C&D and CRE loans, and is just below its 200-day simple moving average of $38.69. Investors Bancorp (ISBC - Get Report) -- A key level until the end of 2016 is $10.68 with a key level of $13.19 until the end of March versus Tuesday's close of $11.68. This bank remains overexposed to CRE loans. Northeast Bancshares (NWBI - Get Report) -- A key level until the end of 2016 is $11.67 with a key level of $13.81 until the end of June, versus Tuesday's close of $12.72. This bank is not overexposed to C&D or CRE loans, but is below its 200-day simple moving average of $12.86. Old National Bancorp (ONB - Get Report) -- A key level until the end of 2016 is $8.81 with a key level of $14.35 until the end of January, versus Tuesday's close of $12.48. This bank is not overexposed to C&D or CRE loans, but set a new low of $12.21 on Tuesday. Bank of the Ozarks (OZRK -- A key level until the end of 2016 is $42.84 with a key level of $51.36 until the end of June, versus Tuesday's close of $46.92. This bank remains overexposed to C&D and CRE loans, but is above its 200-day simple moving average of $45.48. PacWest Bancshares (PACW - Get Report) -- A key level until the end of 2016 is $22.32 with a key level of $45.68 until the end of March, versus Tuesday's close of $38.89. This bank remains overexposed to CRE loans, and set a new low of $37.93 on Tuesday. Texas Capital Bancshares (TCBI - Get Report) -- A key level until the end of 2016 is $40.40 with a key level of $47.37 until the end of March, versus Tuesday's close of $43.38. This bank is slightly overexposed to C&D loans, and set a new low of $42.53 on Tuesday. Umpqua Holdings (UMPQ - Get Report) -- A key level until the end of 2016 is $14.04 with a key level of $16.93 until the end of January, versus Tuesday's close of $14.81. This bank remains overexposed to CRE loans, and set a new low of $14.47 on Monday. An explanation of my "key levels": My proprietary analytics were designed 30 years ago and you will not find them in any textbook. Key levels are based upon the last nine closes for a stock or market in several time horizons -- weekly, monthly, quarterly, semiannual and annual. My assumption was that nine years of closing price history is enough to assume all possible bullish or bearish market-moving events. Levels below the current price can be used to buy on weakness. Levels above the current price can be used to sell on strength.